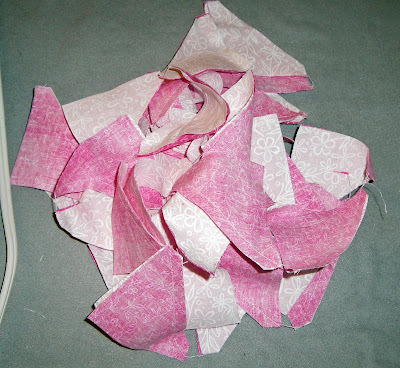 I have a lot of pink fabric left over from the Breast Cancer Quilts. I also read somewhere that you could make a Hunter's Star Quilt using some of the die cuts from the AccuQuilt Go Value Die Set. I love the hunter's star pattern. But, I've never made one. So, I used some of my backing scrap fabric (cut off from trimming the quilts) and set to cutting out lots of 2.5 inch triangles. There are only 2 triangle dies on each pass but I put up to 4 layers of fabric myself. 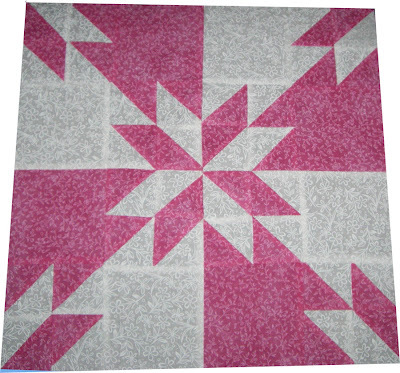 I figured that I needed 8 pink triangles and 8 white triangles and then 1 pink square and 1 white square. This block has a lot of pieces but I think it just might work. Hopefully I don't tire of all the pieces. Here's 4 of the finished blocks. To my surprise, it works. Can you spot all the pieces? If you would like me to write up instructions, let me know. Excellent way to use leftovers! I love the Hunter's Star pattern. Have a happy day! I, too, love the Hunter's Star. You did a great job. Please don't tire of it, I would like to see the end result.